Demand generation is not simply an ad hoc email campaign or a one off webcast. It is a holistic and complex approach to marketing involving multiple areas of the organization. While their are many ways to approach demand generation, we wanted to share some of the top ways that NetLine clients have been able to streamline their demand generation processes leading to a significant improvement in their return-on-investment (ROI). 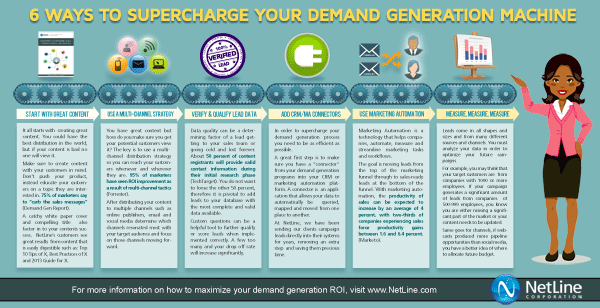 NetLine contributes to the success of demand generation programs through strategic content consulting, expanding syndication/distribution reach, utilizing powerful technology to verify/qualify data and building connectors from clients’ lead generation campaign directly into their CRM or Marketing Automation platform. How do you optimize your demand generation process? Posted by Tony Sala on March 19, 2013 .